Minibar continues to straddle their UK origins and adopted California home. On this third CD the balance continues to tilt towards roots-rock, with the oft-mentioned Wallflowers and Wilco still being relevent comparisons; the Wallflowers' Rami Jaffee even turns up on Hammond organ for a pair of tracks. But even with their twangy guitars and rasp-and-whisper vocals providing a blend of rock, country, and soul, there's still an underpinning of Brit power-pop in the dense melodies and harmonies. The latter is highlighted on "Wide Open," thick with vocals and guitars reminiscent of Teenage Fanclub. After a major label release for Universal and an indie on Foodchain, the band has issued this one on their own, distributing it through CD Baby and at their shows (including an upcoming tour backing Pete Yorn). The opening "Things I Left Behind" catalogs the abandoned jetsam of the indie experience in a travelogue of lost clothes, bandmates, LPs and experiences strewn through the years. On the flipside, "Can I Call You A Cab?" lingers over the physical and emotional remains of a relationship, pondering how to move on. The dissolute closer, "In the Strings," mulls the same quandary, but with a sense that 'goodbye' is the only answer. The band's rhythm battery has the bouncy snap of a well-honed pop band, but with enough swing to give it soul. Simon Petty's voice defines the band's sound, with a rasp that sits perfectly among (rather than on top of) the band's mix of acoustic and electric guitars. 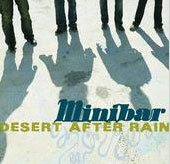 Minibar may have missed the broad commercial window for their brand of rock (although Americana radio should eat this up), but those who love beautifully produced pop with twangy edges should check this one out. 3-3/4 stars, if allowed fractional ratings.